Bring: Yoga mat, layers for warmth, water bottle & your Springtime Joy! 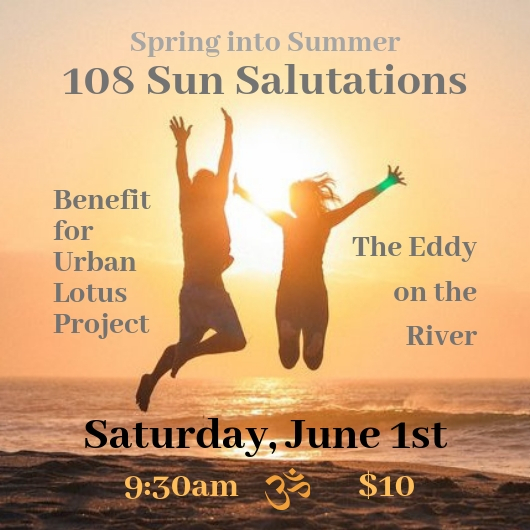 Come celebrate the season of renewal with some of our city’s finest teachers as they guide us through 108 Sun Salutations at The Eddy on the River. Spring is a time of new life, new awarenesses, new boldness and new beginnings. Why 108? We build heat (tapas) to cleanse, detoxify and prepare our bodies for the upcoming months. 108 is a sacred number in Hinduism, Buddhism and yogic tradition. • There are 108 beads in the mala for meditation & concentration of mantra. • Desires. There are said to be 108 earthly desires in mortals. • Time. It is said we have 108 feelings. 36 related to the past, 36 related to the present, and 36 related to the future. • The diameter of the sun is 108 times the earth.